Boat Description Cruising in style that says it all.The Quicksilver Classic 20 is a perfect marriage of form, innovation and technology. She will be sure to turn heads as well as attract the attention of fine boat connoisseurs.The Classic 20 combines the elegance of the golden years of boat design with modern materials, performance and comfort. The MerCruiser V6 4.3L MPI or the D1.7L give you all the power you need for skiing or wakeboarding. And when its time to slowdown, the sunpad aft invites you and your crew to bask and relax. The L-shaped passenger seat allows you to share the pleasure with up to 4 people. 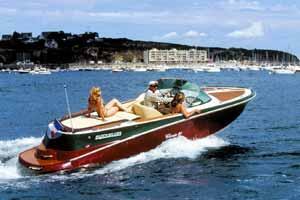 Naturally, the Classic 20 comes standard with canopy, teak laminate cockpit floor, a mooring cover and much more.